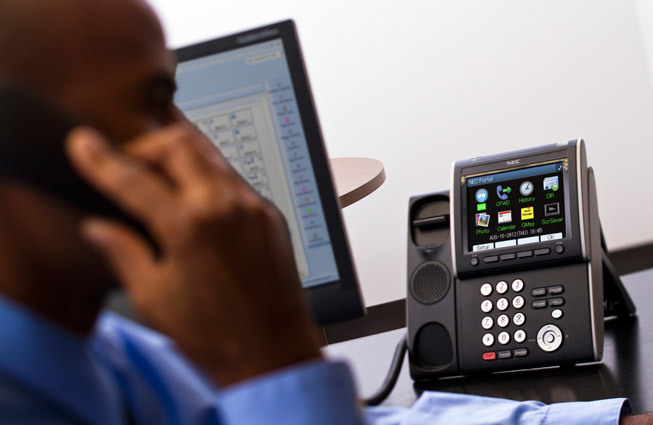 Considering a new phone system – read this first! Hosted telephony is when your phone system is in the Cloud and your calls are delivered over an Internet connection, rather than a traditional phone system with ISDN lines housed in your office. If you are considering a hosted system for your business, you will probably start by going online to research your options and learn about the different types of licences available. However, you may come across misinformation and ‘myths’ about VoIP (Voice over Internet Protocol) that could affect your strategy for communications. Hosted telephony is a modern, technologically up-to-date phone system, which offers users a number of features that are often easier to use when compared to PBX (Private Branch Exchange) but it is not more complex for your day-to-day use. In fact, the opposite is true. With hosted telephony, your communications are centralised and can all be accessed with an easy to use dashboard, making all call performance transparent. Through this data, it is easier to make business decisions on your bandwidth and the use of additional features, meaning your system is tailored to your usage with the most appropriate license. Another simplification is that maintenance is included: the provider maintains both the hardware & software and there are no costly set-up fees. All numbers across multi-sites can remain the same when you move to hosted telephony and, if you expand into new offices or a new geographical location, the same central number can still be used. Hosted telephony isn’t tied to one physical location or area code – this flexibility can benefit businesses that are in a period of growth or those requiring mobility. It’s really useful because the same number can show from connected mobile devices when staff are at home (working remotely), on trips, or simply out of the office. Call centres and large companies experiencing a high volume of calls across multiple sites definitely benefit from VoIP, but so too can medium and smaller companies. A smaller business can use hosted telephony, with calls going over the Internet, to grow their business whilst they retain budget to put into other areas of the company. If you’re a small business, you can save on expensive set-up costs, upgrades and downtime that could affect client retention and work against your business objectives. As hosted provides a very professional level of customer service, smaller businesses can seem bigger than they are in reality. Medium businesses with multiple sites can also save on call costs; calls between multiple sites on the same system are free of charge. Voice quality and reliability are two of the main cornerstones of hosted phone systems and relate to the reliability of your broadband connection. In the early days of hosted telephony inadequate connections meant poor service for many. However, in recent years, the service provided by broadband has improved hugely and any downtime is typically minimal as providers are aware of the importance of a strong connection to businesses. Picking a reputable data provider who has the ability to manage Quality of Service (QoS) and has the knowledge to match your voice requirements to the capabilities of the available data connections is essential. Whilst extended downtime is highly unlikely, a range of features are provided to minimise disruption so calls are not missed. These features include voicemail, voicemail to email and call forwarding. Users with mobile licenses aren’t reliant upon the office Internet connection either, as this can operate on 4G networks. When you look to upgrade to hosted telephony your requirements, including users and call traffic, are analysed to provide a specific recommendations to ensure your connection is appropriate and reliable for your needs. Traditional PBX systems are run on local lines, often through copper cables and ‘clear channels’, meaning voice transmissions are not encrypted. Should someone want to listen to a call over a PBX, it is possible with the right equipment. VoIP is more secure as it can be hidden behind a firewall, encrypted and monitored by software 24/7. Once you upgrade, users can be assigned different levels of access to the system, with a verified log-in process. Link-Connect is not only a Gamma telephony Partner, but also a wide area network and security specialist and a trusted Private Cloud supplier. This puts us in a good position to help you ensure your telephony solution fits your business needs and that your entire infrastructure is in place to support a smooth switch-over. Download our free Buyer’s Guide, which highlights the key considerations you should take into account so that you can find the right system for you. Click here to read more about our telephony solutions.